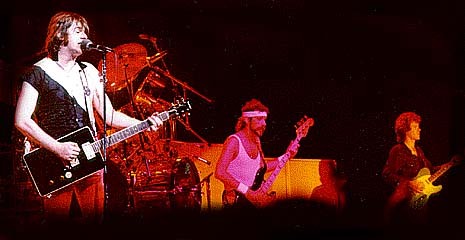 Today I do interactive 360 degree panoramas, but here are a few concert photos from back in the day. They're old low res scans from so long ago I was using a rented scanner because they were too expensive to own. 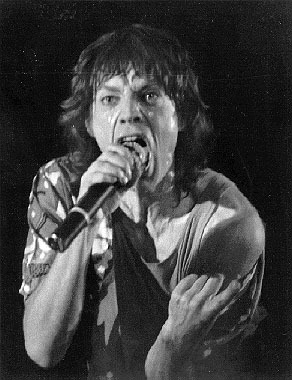 This is mostly an excuse to write about my insane quest to shoot a Rolling Stones concert in 1981. These two photos and about a dozen others were part of major Rolling Stones features in the Baton Rouge State Times and the Mississippi Gulf Coast Daily Herald. 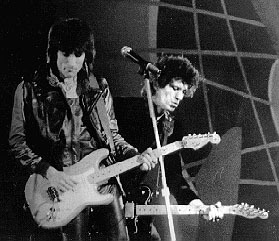 In 1981 I was a big Rolling Stones fan, but I was incredibly poor, so a week before the Stones concert I asked my local paper, the Mississippi Gulf Coast Daily Herald, if they would buy me a ticket or get me a stage pass in exchange for concert photographs. They laughed, and said smugly "Our photographer has connections to the Stones, and he'll be partying with them and get backstage pictures and everything. Even if you manage to get any photos we aren't interested." I made the same pitch to the Baton Rouge State Times, and while they wouldn't give me a ticket, they were interested in buying pictures if I got some good shots. Driven to glory by a crazy voice in my head that said "Go Forth And Do Something Great, Or At Least Something Really Cool", I set out on my odyssey. To start with, I needed a 35mm camera, since I only owned medium format cameras, which were huge and hard to smuggle into a concert. The morning of the concert I asked the clerk at K-Mart if I bought a 35mm SLR for my dad, and he didn't like it, could I bring it back the next morning - then I wrote a hot check for a cheap Pentax 35mm and Vivitar zoom lens. My wife was 8 1/2 months pregnant so we played it safe and I left her our van and hitchhiked alone 70 miles to New Orleans. (Otherwise my son Erik would probably have been named Mick or Keith because he was born on the floor of the Superdome in the middle of a Rolling Stones concert.) I got rides quickly and made it to the Superdome before noon, early enough to get a good place in line. It was almost for nothing, though - when they finally opened the doors to the Superdome and I started through, a cop grabbed me for a quick pat down. I had the lens stuffed down my pants and the camera body cinched up tight under my armpit, underneath my coat. The cop felt the camera under my arm and freaked out. He shouted "GUN!!!" and smashed me up against the door hard. Squished against the glass like a bug on a windshield, I gasped out something like "Dod shood! Camwa! Cam! Wa!" At least that adrenaline rush helped prepare me for the next step - walking over a bunch of people to get up front! In spite of the delay from the search, I still grabbed a spot close enough that by the time the Stones took to the stage NINE HOURS later, I had slowly and methodically crushed everyone in my path and made it all the way to the front. It wasn't all brute force, though. A few light, swift "accidental" zooms to the ear can work wonders. Saying I was working for a paper helped too. When I made it to the second row, two guys heard me say I was shooting for the Baton Rouge paper. They were from Baton Rouge, and not only let me in front of them, they offered to get down on their hands and knees so I could stand on their backs for a few shots. Seriously! I had a great time and enjoyed the concert immensely, but then it was time to hitchhike 70 miles home. From New Orleans. In the middle of the night. Before I could even get on I-10 some thug tried to take the camera and I had to run down the middle of the street dodging traffic to get away. I thought the camera and my Rolling Stones t-shirt would get me a ride from concert goers, but I walked for hours until I got picked up. When I finally got back to Gulfport it was 4 am. I had to hurry to finish developing and printing the pictures before dawn because the bathroom darkroom in my mobile home wasn't light-tight enough to use in the daytime. Finally I rushed back to K-Mart to return the camera that was "too complicated for my dad" and get my check back before it bounced. I sent prints to the Baton Rouge State Times, and they bought several for a special on the concert. Encouraged by that, I decided to try the Daily Herald again. Things were a little different this time around. They told me "Thank you for coming by again! Thank you! Thank you! We didn't know how to contact you. Our photographer's connection fell through and he couldn't even get in the Superdome! The only photos we've got are what came from the wire services. Pleeeeeeease can we buy a bunch of your photos for our big Rolling Stones special?!?!" Talk about making it all worthwhile! This one's for you, Leila, where ever you are. What a night! Every time I drop acid and make love wearing a black silk cape and day-glo fangs I think of you.